If I may be transparent for a moment, I recently started a board on my Pinterest account that I titled "A Manly Board". It mainly consists of photos of awesome facial hair, tobacco pipes, and Christopher Walken. While the board is (mostly) tongue-in-cheek, even the serious portrayals of masculinity are almost always similarly one-dimensional. Manhood is all too often measured in terms of testosterone and Testarossas, MMA and MGD, chest bumps and chest hair. Sometimes, even well-meaning Christians try to shoe-horn Jesus into the popular definitions of masculinity, painting him as muscle-bound carpenter whose blue collar work gave him a physique just shy of a body builder. While I am not saying this is impossible, I am saying we're better off letting what we know of Jesus form our ideas of masculinity rather than vice versa. 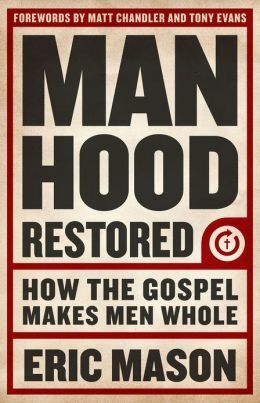 And that is exactly what Eric Mason does in his book Manhood Restored: How the Gospel Makes Men Whole. 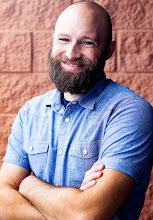 Mason holds up Jesus as the ultimate example of what masculinity should look like and then shows how this restored vision has a dramatic impact on our worldview, sexuality, vision, family, and church. "We need fathers, and we’re only going to be fathers to our children when we see that true fatherhood is rooted and defined in God the Father. " To be completely honest, I had intended to have this review done and ready in time for Father's Day yesterday, but it actually worked out for the best that I am late because today (and I'm not sure how long, so hurry) you can buy the Kindle version of the book for only 0.99! !